If you run very fast, the very speed gives you an intoxication. That’s why there is so much addiction to speed. If you drive a car, the mind wants to go faster and faster. It makes you intoxicated. Speed releases certain chemicals in the body and in the blood; that’s why you would like to go on pressing the accelerator. Just run fast one day and watch what happens. A moment comes when the speed takes over: that is the acceleration of speed. Just the opposite happens if you slow down. 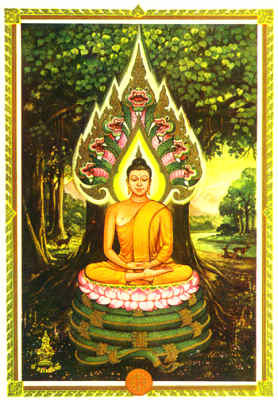 What is a Buddha doing under the tree? — slowing down the speed, nothing else. What am I continuously teaching you? — slow down the speed. Come to a point where there is no speed within you, nobody running. In that moment awareness happens — you become enlightened. There are two poles: one is speed; then you are intoxicated, you become unconscious. The other is no speed — slowed down completely, totally, an absolute stop. Suddenly you become enlightened. Slow down your speed. Eat slowly, walk slowly, talk slowly, move very, very slowly, and by and by you will come to know the beauty of inactivity, the beauty of passivity. Then you are not intoxicated — you are completely aware and conscious.